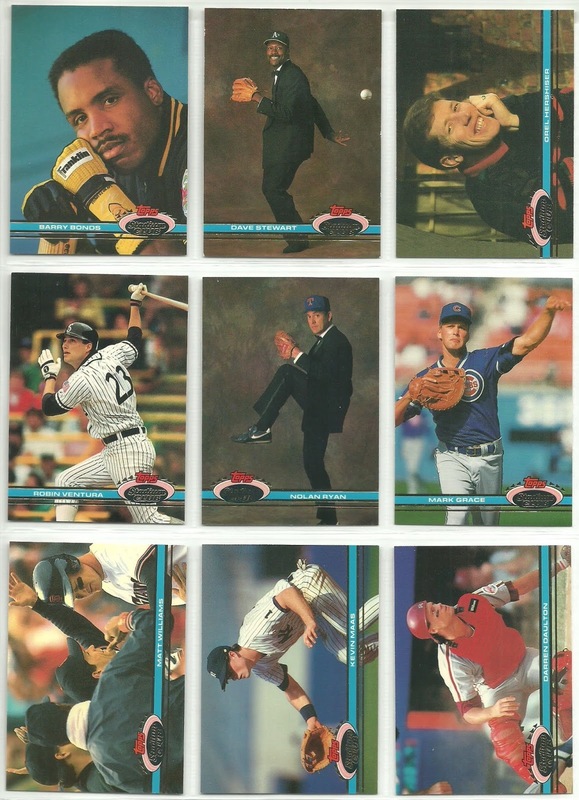 Every once in a while I check Facebook Marketplace for baseball cards, but up until a week ago I'd never actually bought anything. This purchase actually began several weeks ago. 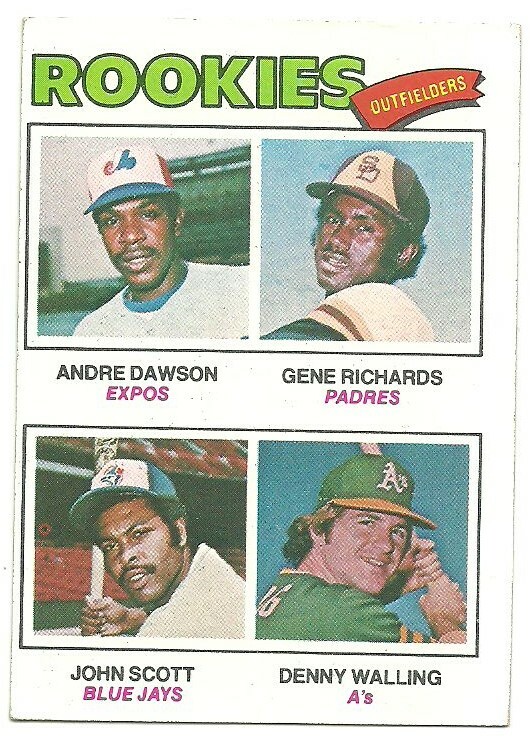 A post caught my eye because the photo showed a variety of Topps factory sets. The post claimed 1988 - 2007. I would later find out that it was really 1989 - 2007. It was a 500 count vending box of 1988 Topps and not a complete set. The seller was asking $200, which isn't a bad deal, but I have some of the sets already so I messaged the lady saying I'd be interested in looking at them at $100. She messaged me right back and said that she already had someone interested at the full price. Fast forward a week or two and I get a message saying I can have them for $100 if I'm still interested. I told her I was and we arranged to meet. At $100 for 19 complete sets, that works out to $5.26 per set, which is a great deal in my opinion. 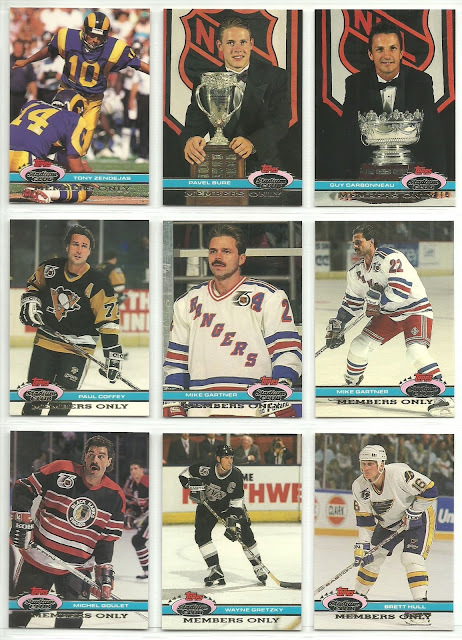 What I didn't realize was that there were other cards in the collection that came with it. The lady I purchased the cards from said that her husband had collected cards for a while, but had just lost interest and they were taking up too much space. 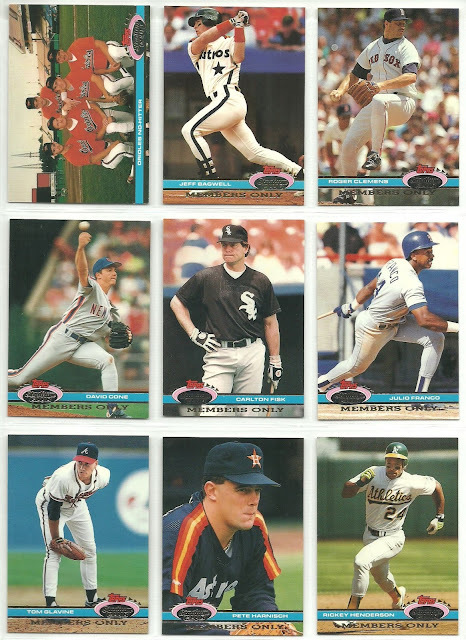 He must have been around my age, because I feel like the majority of the cards are the same stuff that I collected as a kid. 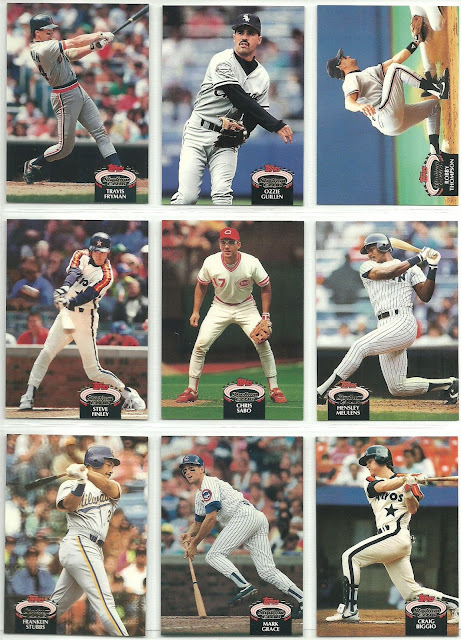 I'm comfortable with the $100 for the 19 complete sets, so everything else is just a bonus. I'll show off some of the random stuff in my next couple of posts. 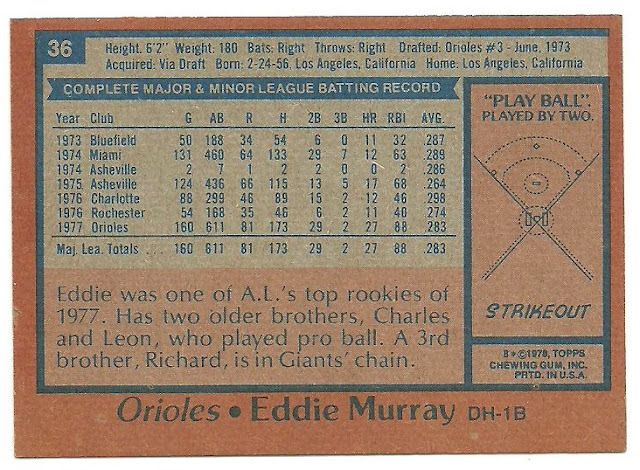 My post last week about a potential contest with an extra Eddie Murray RC and mystery 1956 Topps card as prizes garnered quite a bit of interest, so I will be moving forward with it at some point in the near future with a contest. 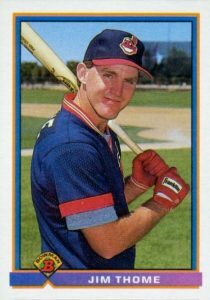 In my initial post I gave an incorrect clue stating it was a second year card of this player. It's actually the third year card of this player. I've been writing my posts all at once and scheduling them, so I only noticed this when Collecting Cutch mentioned in a comment that he hoped it was a Clemente card. 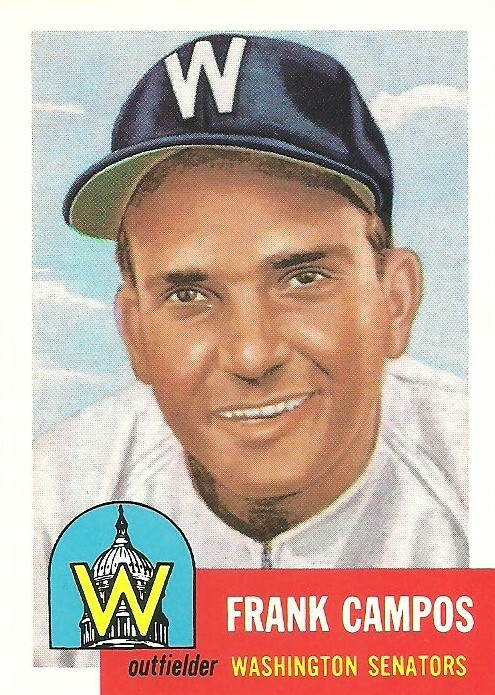 I know that Clemente's rookie card is 1955 and the player I had is 1954, so I knew I must have written something wrong. I apologize. 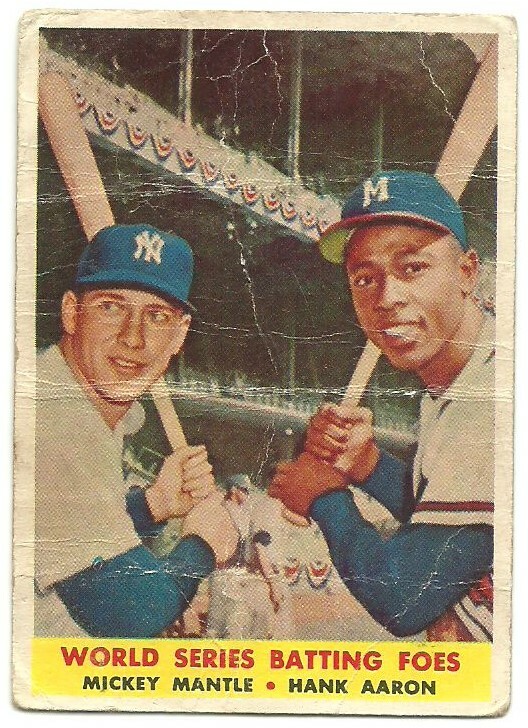 It's not a Clemente card, but it is Hank Aaron with a cameo of Willie Mays. 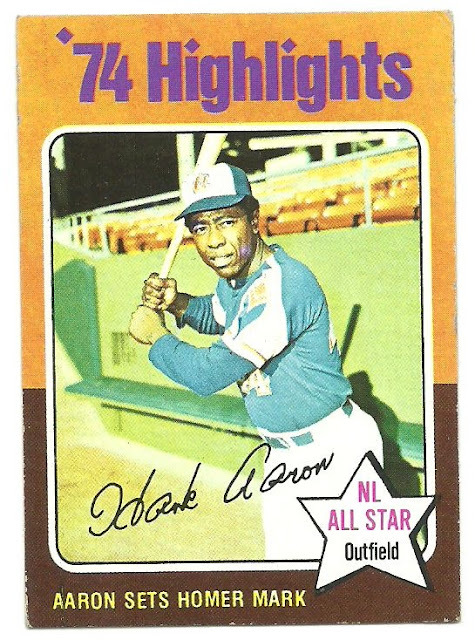 For the action shot, Topps took a photo of Willie Mays and doctored it a bit to make it appear to be Aaron. As I mentioned in my earlier post, the card it in really rough shape, but at the price I got it for I'm happy. I already have one. I was hoping this one was a grey back, as I have the white back version, but it's also a white back version so I'm going to offer it up as a prize in an upcoming contest. 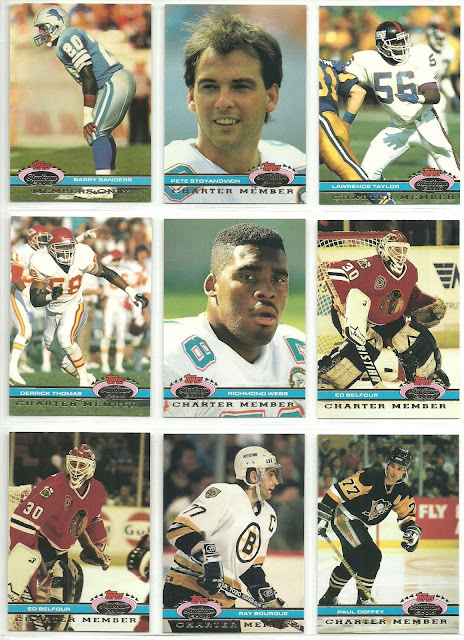 When it comes to Hall of Fame rookie cards, there are some pretty iconic cards for collectors. 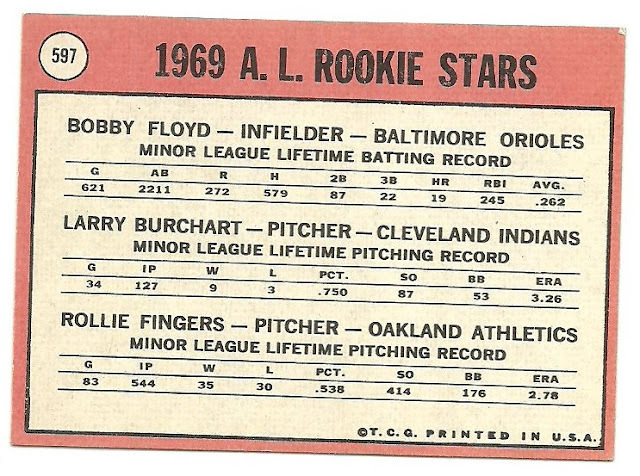 I would list the 1954 Hank Aaron, 1968 Nolan Ryan, and the 1969 Reggie Jackson card among them, at least for me. 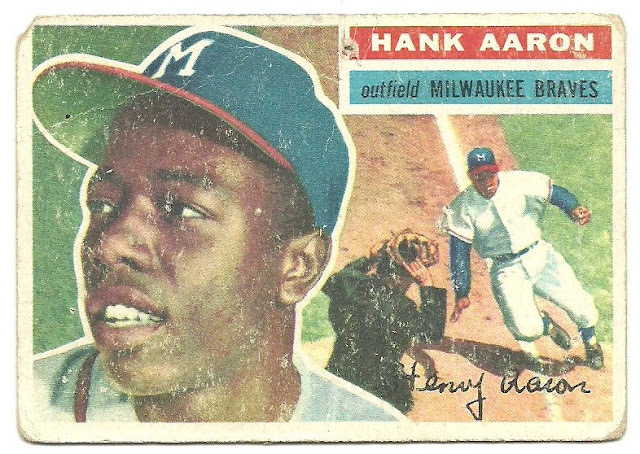 Notice I didn't mention the 1952 Topps Mantle, because that's not his rookie card. 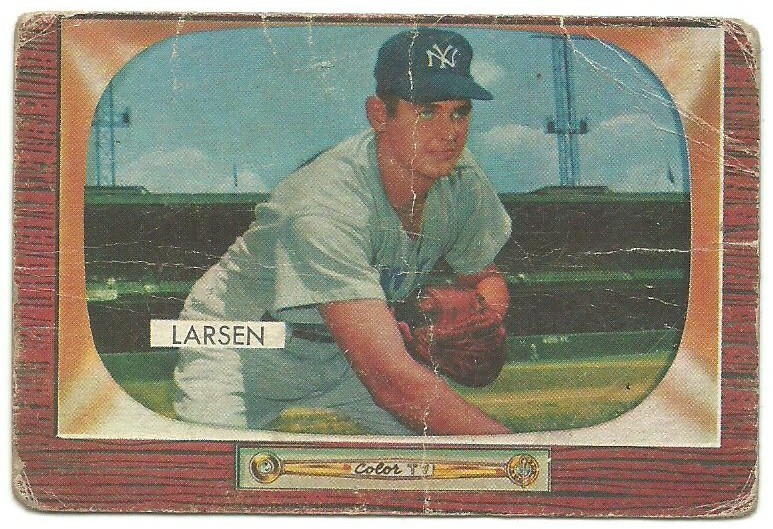 There are others for sure, but there are just some cards that I think most collectors out there can picture in their mind immediately when it's mentioned. Then there are others that are a bit more obscure. 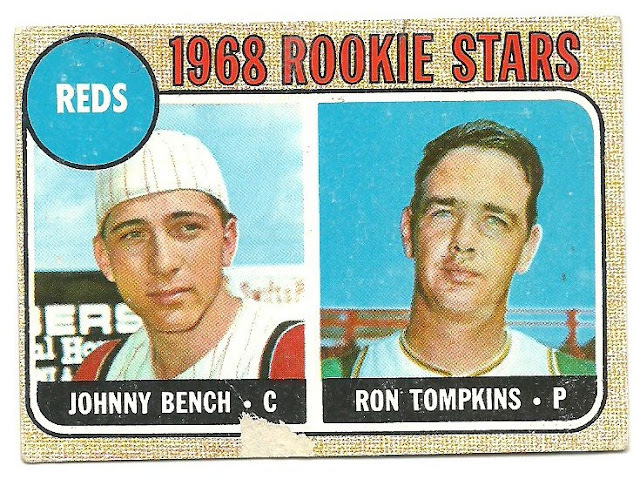 I had to double check to make sure this was Rollie's actual rookie card. It is. A young, clean shaven Rollie Fingers graced this card. 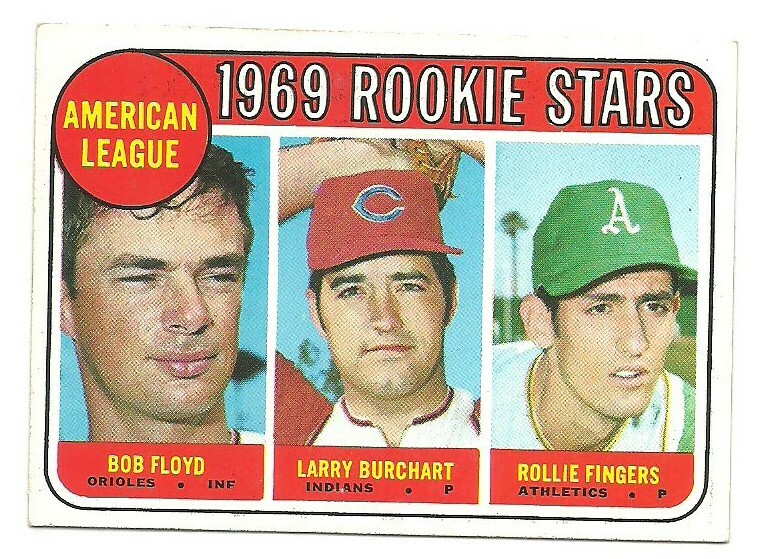 I met Rollie once at the 2011 All-Star Fan Fest and the photo I had of him was mustache free. I asked him if he would draw on his signature handlebar mustache and he adamantly declined. What are some of the more iconic rookie cards for you? 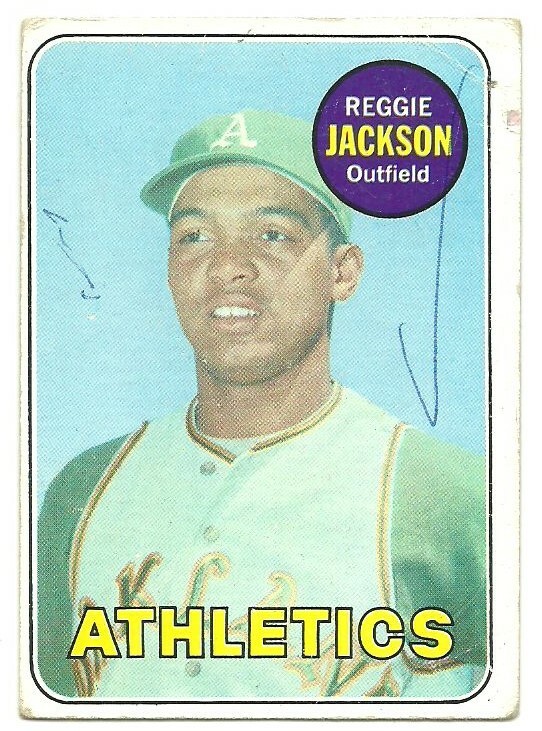 $20 for a Reggie Jackson Rookie Card? Let me get that in writing! 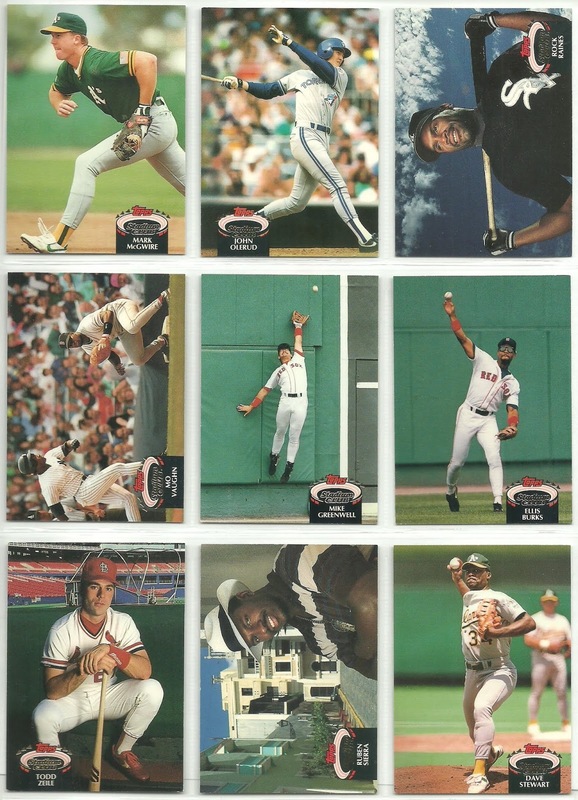 Yesterday I mentioned that I purchased the Jim Palmer rookie card along with another Hall of Fame rookie card for $40 shipped. 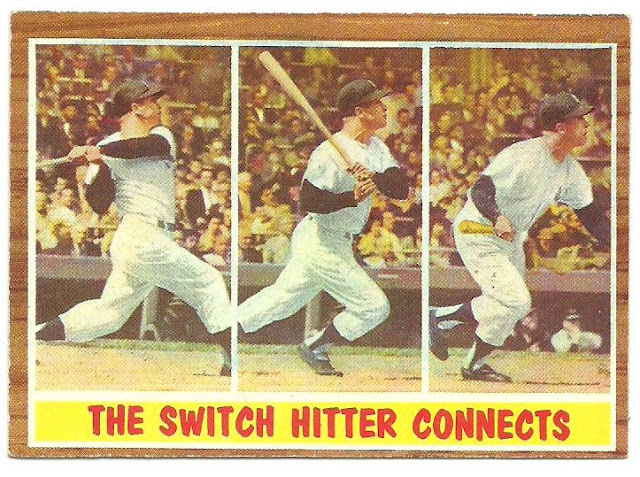 Here is the other card. 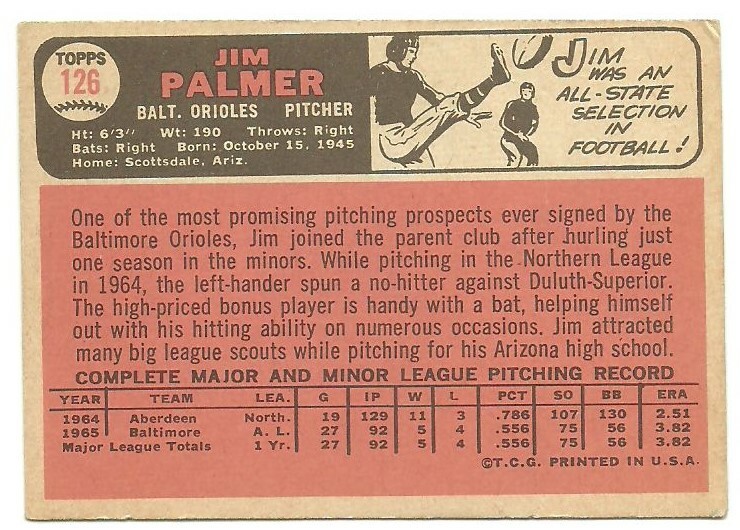 Initially the seller was asking $30 for this card and $20 for the Palmer. Like I said, I offered him $40 for the pair and he accepted. He messaged me though, making sure that I had seen the ink on the Jackson card. I responded "Ink. What ink?" But then I quickly let him know that I was aware. 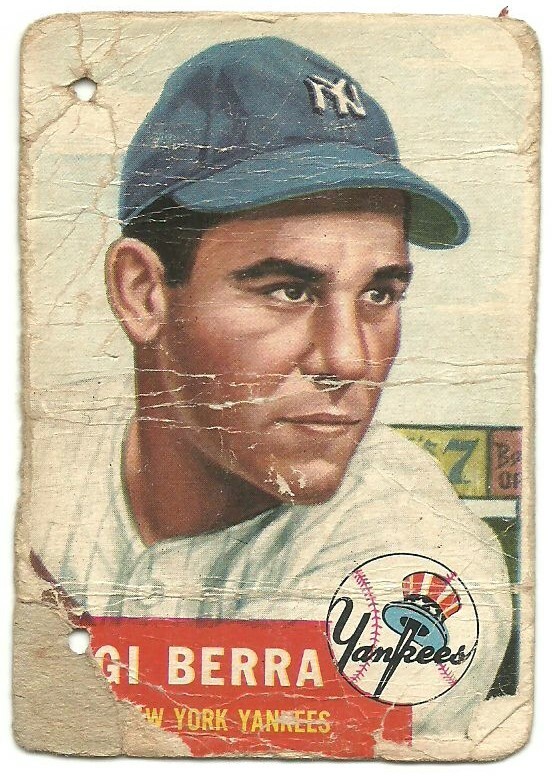 I know the condition is a deal breaker for many collectors, but for me it adds character and made it something I could afford. I'd actually been looking into purchasing this card on ebay a few weeks before and was prepared to spend up to $100, so to get it for $20 was awesome. If I had spend $100, it would have been in much better shape, but I was able to get this card and the Jim Palmer card for less than half of what I was thinking about spending. 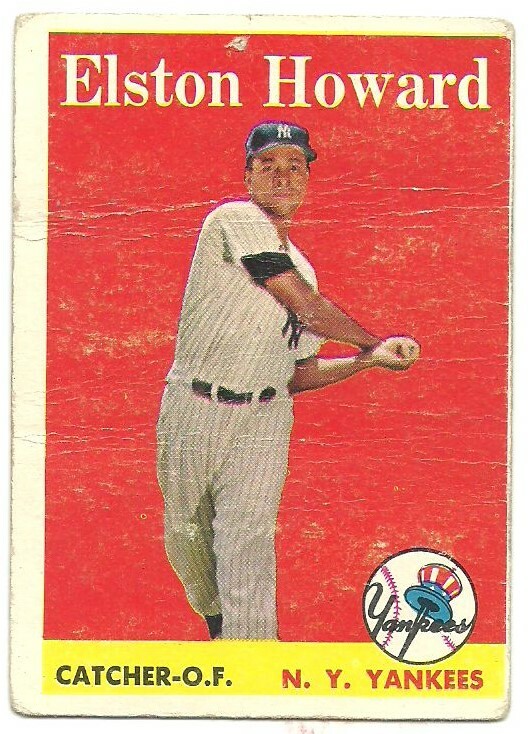 This was a card that as a kid, I dreamed about having, but never thought I'd own it. Much like the Aaron RC and the Bench RC that I now have in my possession. So there you have it folks. Never stop dreaming! Have you been able to add any cards to your collection that your 12 year old self never dreamed you'd be able to afford? 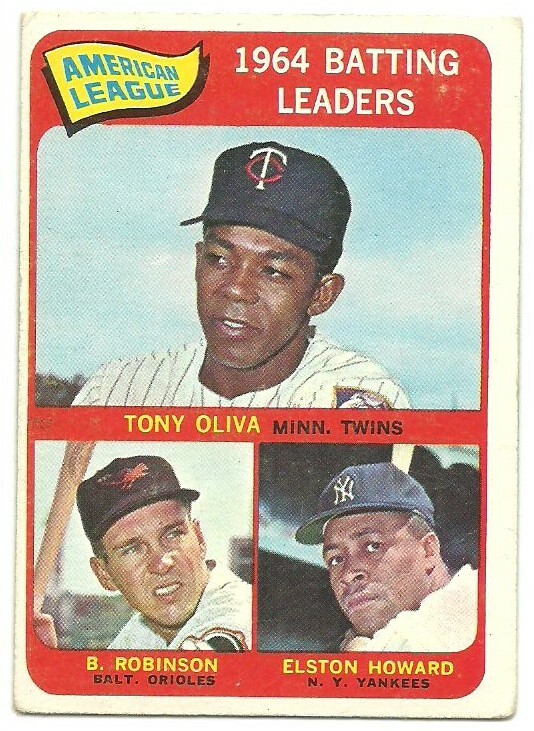 The last three vintage cards I showcased were from a Facebook group, but they weren't from the same guy that I've been buying most of my vintage cards from. 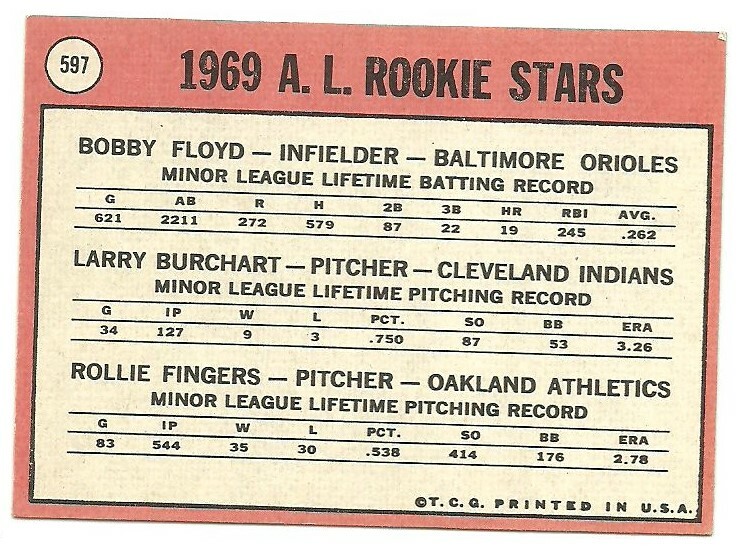 Here's a card from that seller. It's a 1966 Topps rookie card of Jim "Cakes" Palmer. Teammates called him Cakes because he would eat pancakes before every game he pitched. 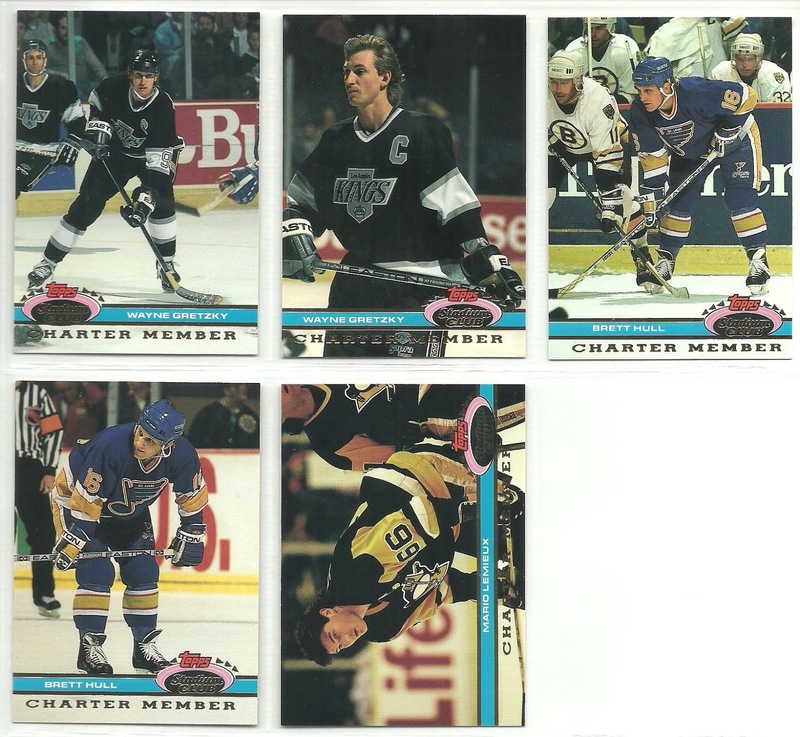 I paired this with another Hall of Fame rookie card and got him to do them both for $40 shipped, so this set me back $20. Not bad for an 8 time 20 game winner. 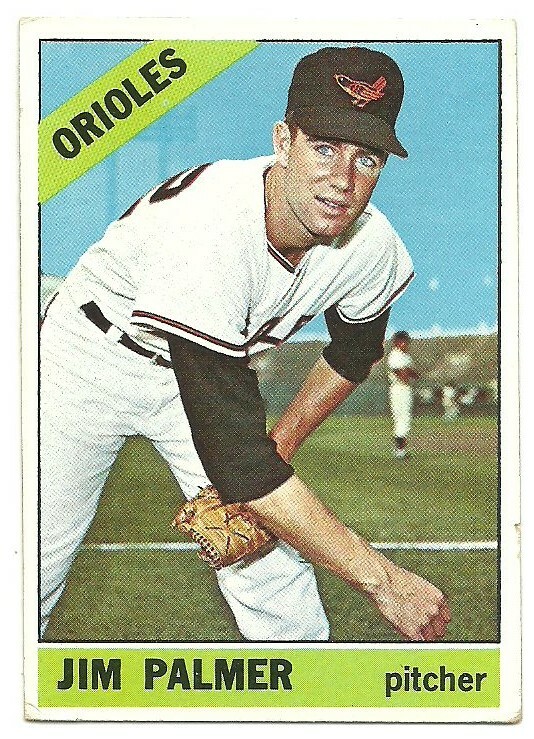 Hard to believe that the Orioles left him unprotected in the 1968 expansion draft. 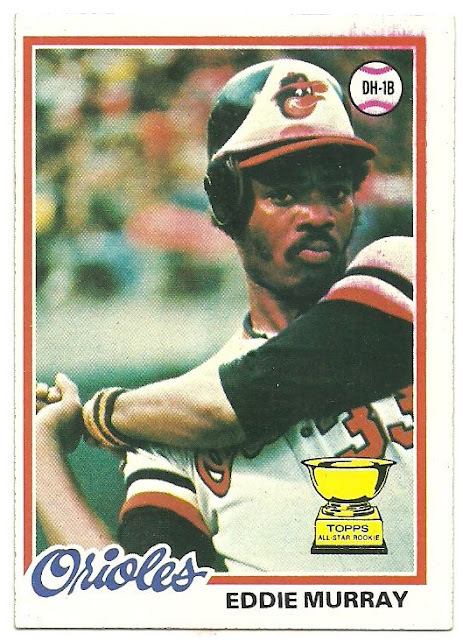 Even harder to believe that neither the Kansas City Royals or the Seattle Pilots didn't take him. 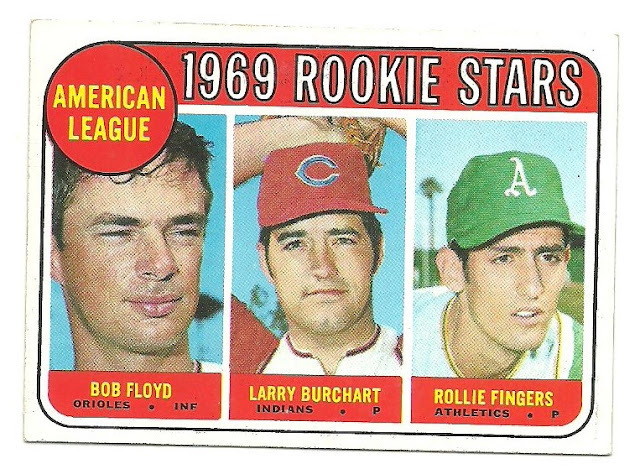 He was in the minors recovering from an injury in 1968, but still. 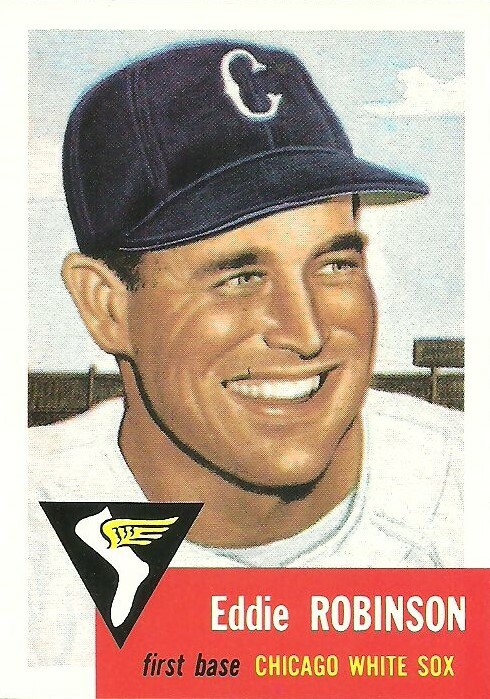 Palmer would go 16-4 in 1969 and then win at least 20 games a year for 8 of the next 9 seasons. Palmer was adopted as a baby and then his adoptive father passed away and his adoptive mother remarried, Max Palmer. This is where Jim got his last name from. Max was a 7'7" actor and professional wrestler turned pastor/evangelist. So even at 6'3", Jim's father had almost a foot and a half on him. How about you, could you eat pancakes every 4-5 days? 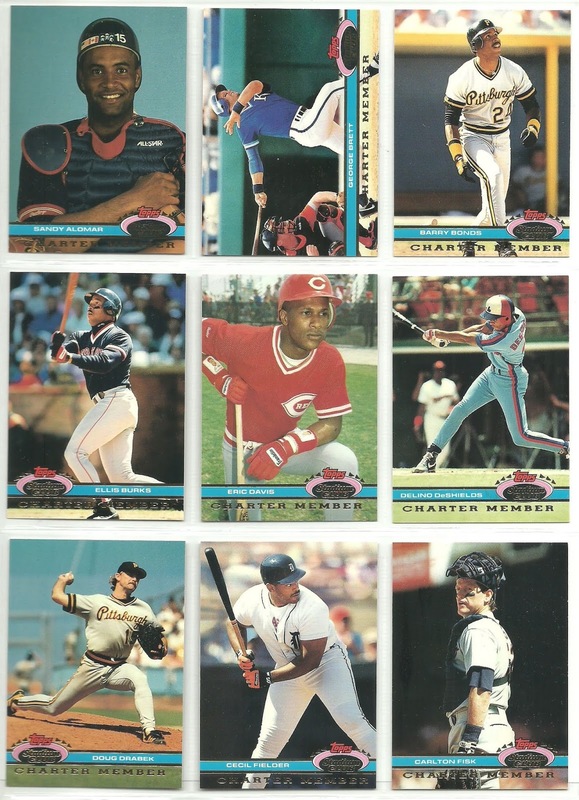 A few years back I purchased a 1987 Topps set from a seller at a card shop for $3.88. Great deal, right? The Barry Bonds and Bo Jackson we in top loaders on top of the cards in the 800 count box, so I assumed it was a complete set. I was wrong. 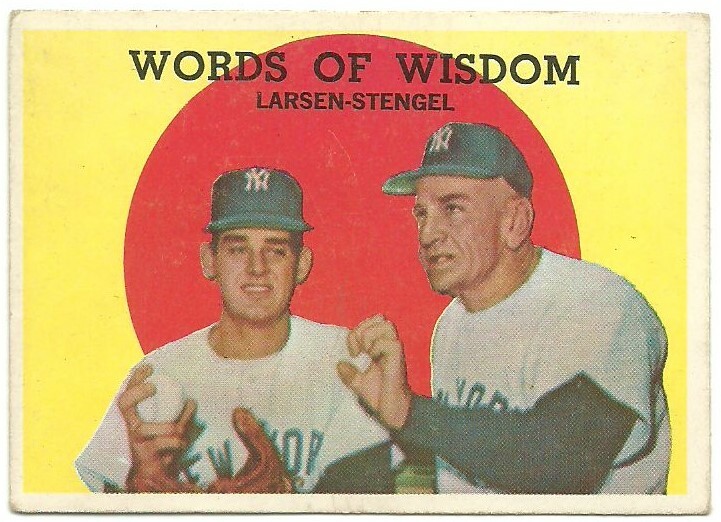 I've been binge listening to a baseball card podcast called Wax Ecstatic. On Twitter, you can find him @WaxAndGumStains. Matt, that runs the podcast, started off by devoting a podacast to a single card from each set 1980 - the early 1990's. 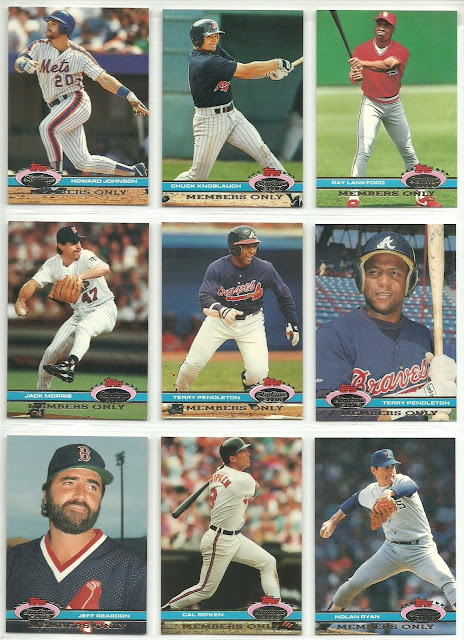 So one for 1980 Topps, then one for 1981 Topps, 1981 Donruss, 1981 Fleer, 1982 Topps, 1982 Donruss, 1982 Fleer and so forth. I think most bloggers would enjoy listening. Go check it out! 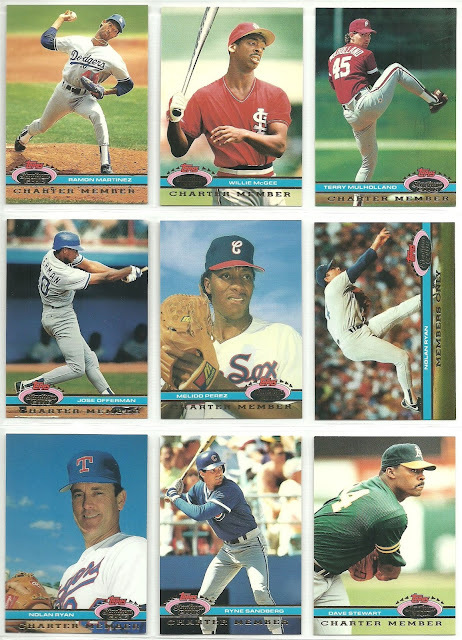 Recently I listened to the 1987 Topps episode and so I was inspired to page my 1987 Topps set. That's when I found out that it wasn't a complete set. I'm missing 37 cards. If you can help me out, let me know. Thanks! 42, 47, 70, 80, 96, 116, 142, 158, 165, 166, 168, 182, 194, 204, 215, 219, 254, 275, 278, 281, 316, 318, 341, 371, 372, 384, 420, 423, 453, 463, 541, 545, 571, 586, 726, 726, 766. Yesterday, when I said I'll buy any HOF RC for $5 I meant it. Even if I already have it. The third and final card from my recent Facebook purchase was this 1978 Topps Eddie Murray rookie card. I got it for $5. I realized later that I already have one. Whoops! I'm thinking about coming up with a list of blog post topics and giving everyone a couple of weeks to post and then randomizing a winner out of all the participants. What do you think about that? Would anyone be interested? 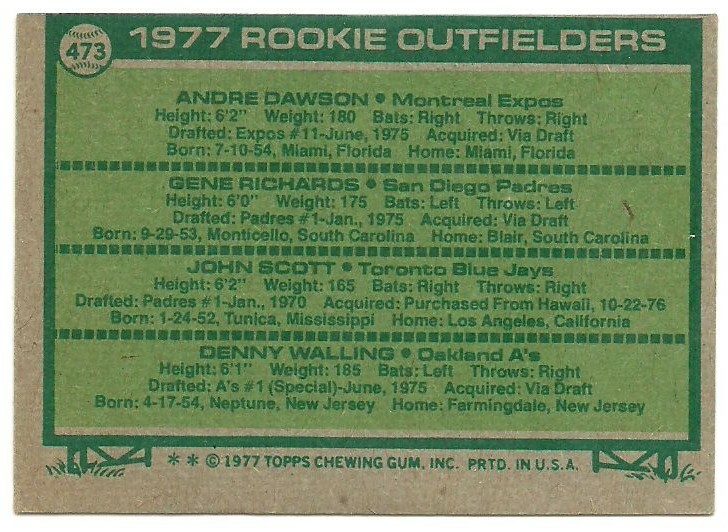 From the same Facebook seller that I mentioned yesterday, I got this 1977 Topps Andre Dawson rookie card. It's miscut and a little soft on the corners, but that's okay with me. 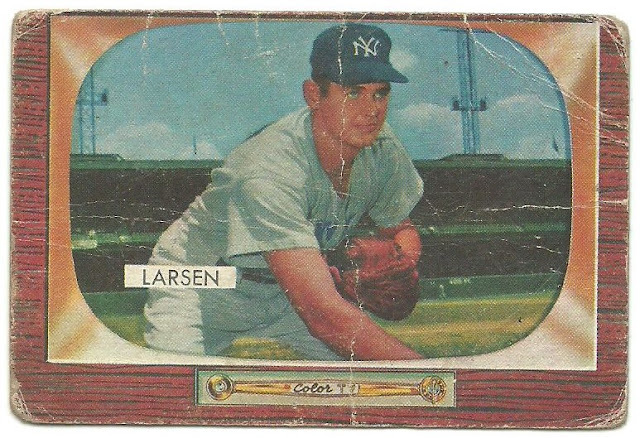 For $5 I can deal with the soft corners and bad centering. 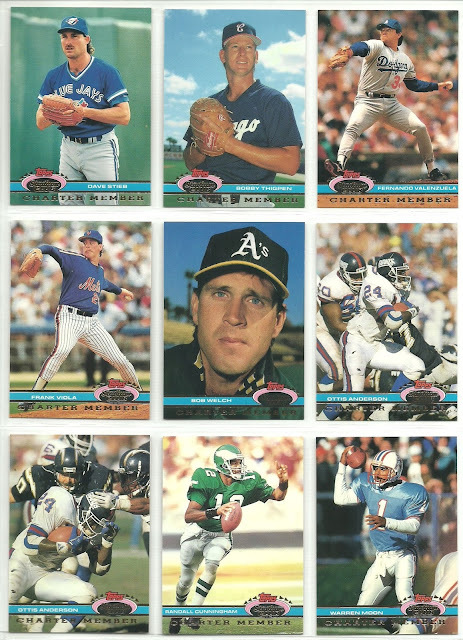 I'll gladly add a vintage Hall of Fame rookie card to my collection for $5 or less. 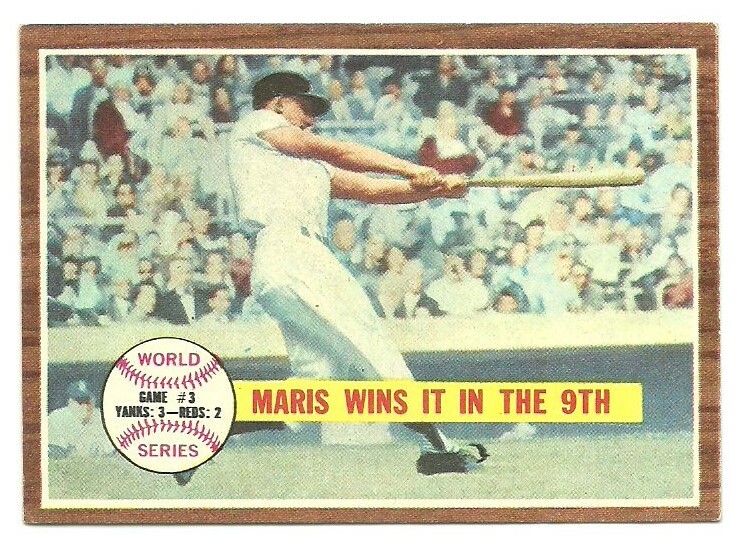 Is anyone going to break the all-time home run record? 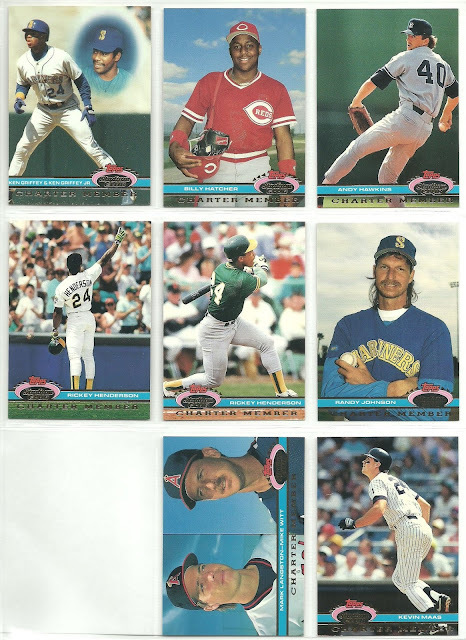 I made another purchase off Facebook recently for some vintage cards. This one turned out okay, but had some hiccups along the way. 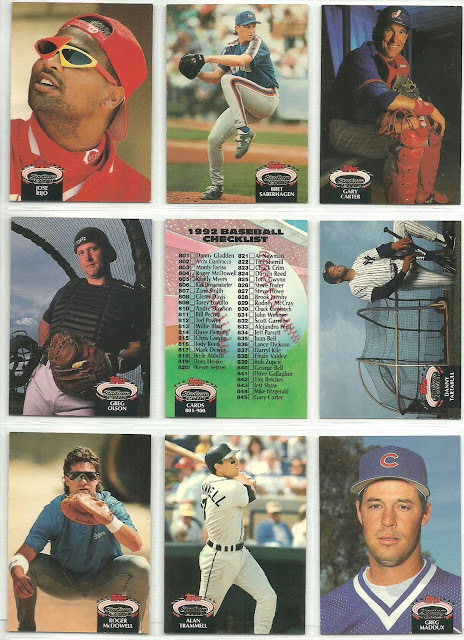 I bought the cards on a Saturday and the seller sent me a picture of the envelope the same day saying "In the mail. ", so I expected the package by mid-week. Wednesday, Thursday, Friday, Saturday...nothing. I messaged the seller asking him when he sent the package. he said he sent it on Monday, but because of the winter storms it might have been delayed. It got here the next Tuesday. Okay, no big deal. Just don't tell me it's in the mail, if it's not in the mail. 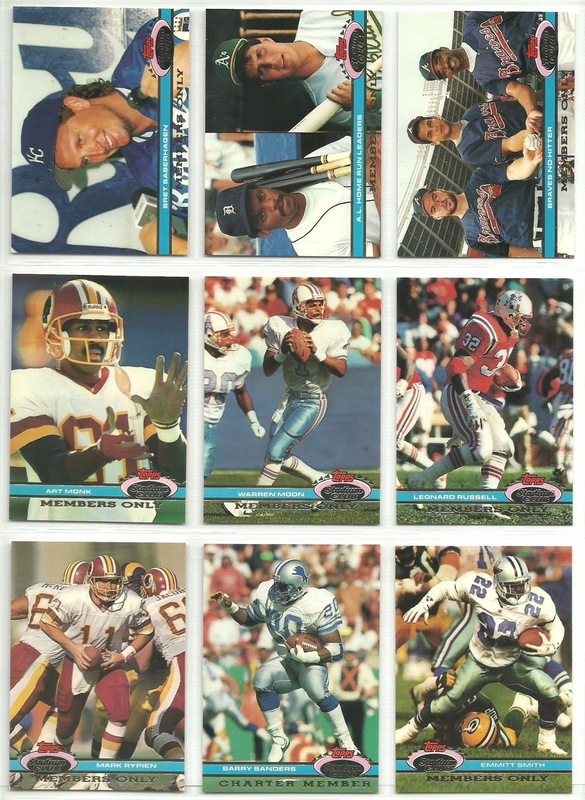 When it arrived I found the three cards in top loaders, but only two in penny sleeves. The seller had taped them together using Scotch tape, but only on the sides, so one of the cards was sliding out of the top loader. The cards weren't in great shape to begin with, but come on! Luckily the cards didn't seem to have any damage from shipping. 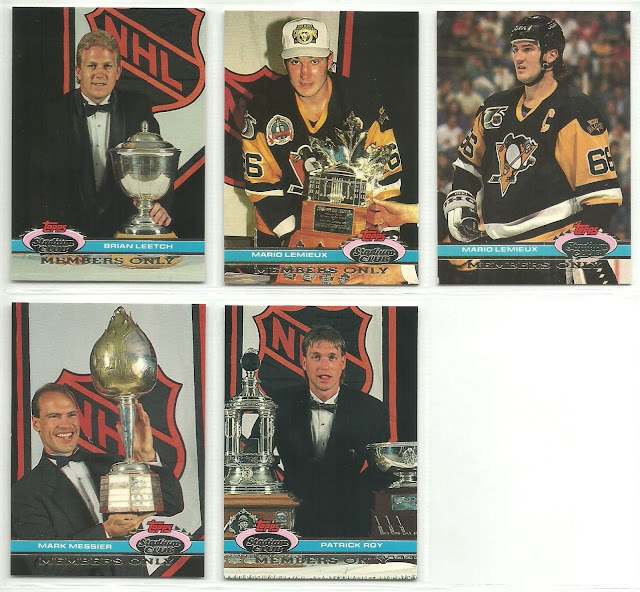 Like I said, they weren't in great shape to begin with, but for vintage I'm okay with that. 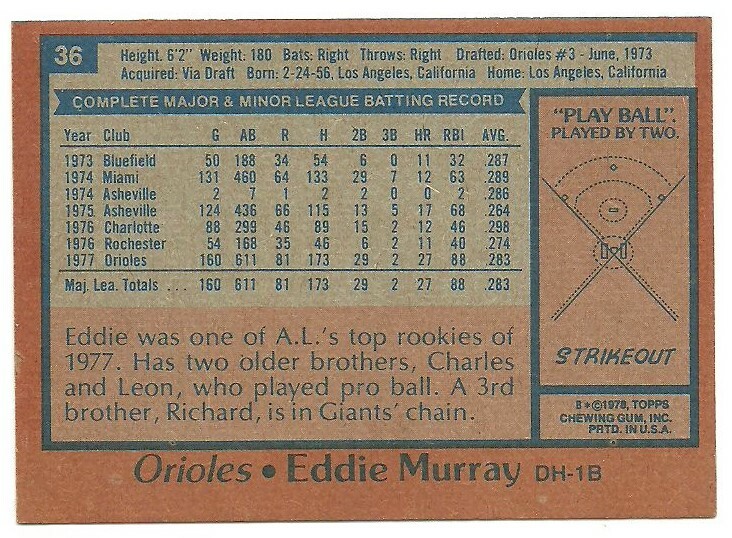 Here's the card that was half an inch out of the top loader, not in a penny sleeve when it arrived. It's a 1975 Topps '74 Highlights card featuring Hank Aaron. 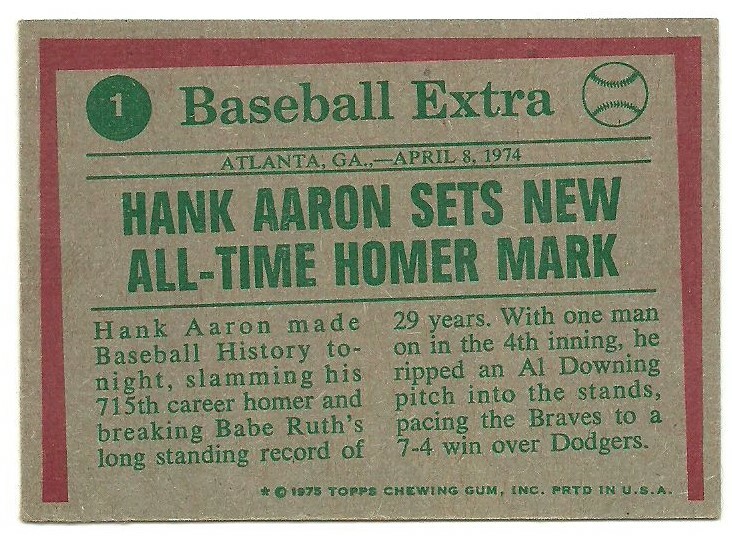 It's card #1 and chronicles April 8, 1974 when Aaron broke the all-time home run record. Hank would finish his career with 755 home runs. A number that I know by heart. 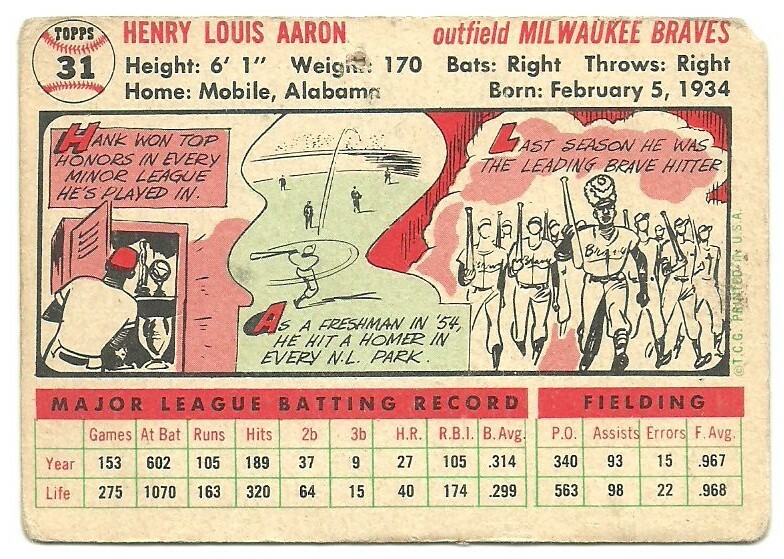 The current home run record is 762. I had to look that up. Anyone out there think anyone will ever break that record? Pujols, at 38 years old has 633 homers going into this season. 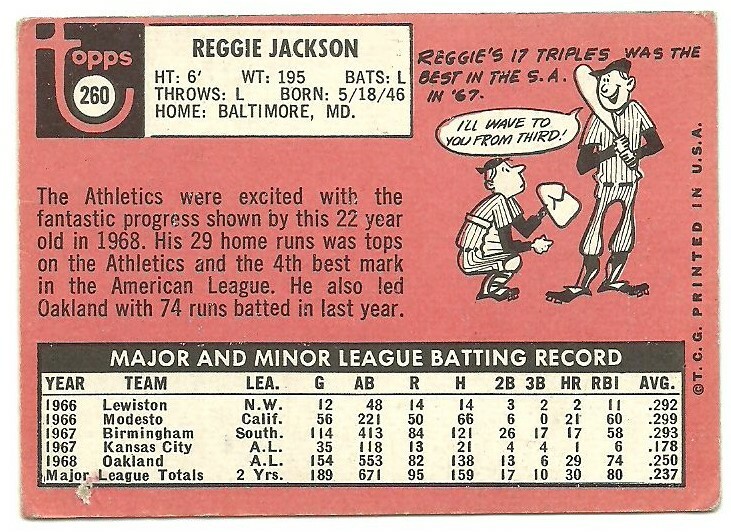 He needs 130 home runs to break the record. Over the past 3 seasons Pujols has averaged 24 home runs. 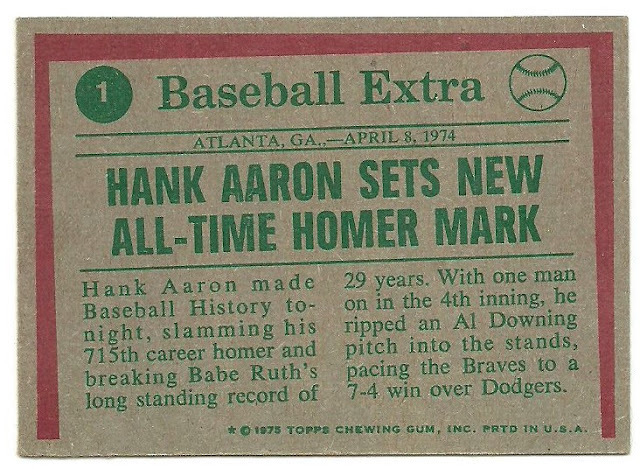 This means he would need to play another 5 and a half seasons at the same home run pace to break the record. I don't see that happening. Miguel Cabrera is the next highest active player on the all-time home run list. 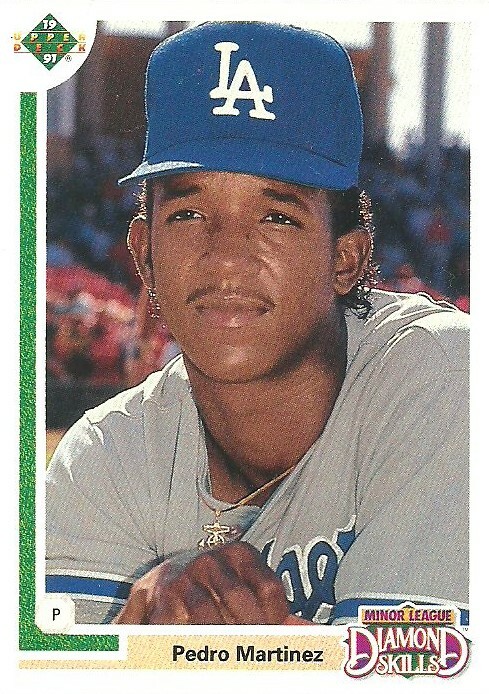 He's 35 with 465 home runs currently. No way he breaks the record. He may not even reach 500. Edwin Encarnacion is the next highest active player on the list with 380. That was surprising. Giancarlo Stanton has gotten a lot of talk as the guy who might be able to break the record, but most of this took place during or right after the 2017 season when he hit 59 home runs. 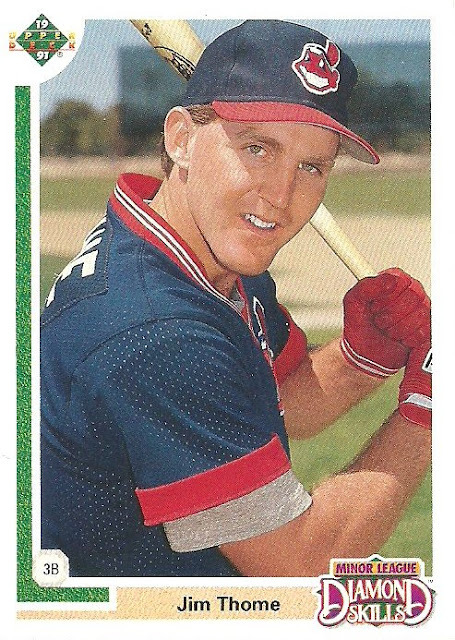 Last year he hit 38 home runs. 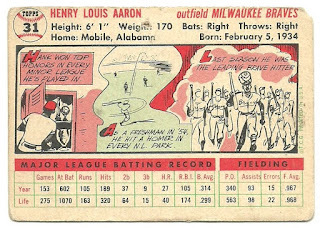 He's 29 years old with 305 career homers. He would need to average 30 home runs for the next 15 seasons to break the record. Is it possible...yes. Likely, No. What do you think? Is anyone currently playing going to break the home run record? 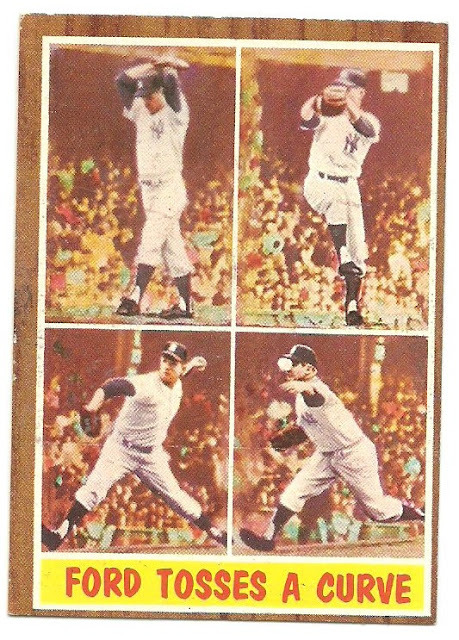 Okay, let's finally finish off the vintage New York Yankees 12 card lot that I paid $40 for from a Facebook group back in December. The last three cards are all the same card. 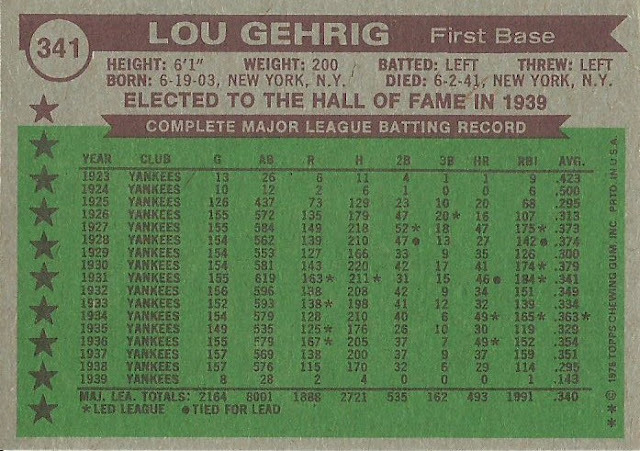 It's a 1976 Topps All Time All Stars card of Lou Gehrig. Here is the back. If he's gotten a few more at bats in 1923 and 1924 or of course if he hadn't gotten sick, Gehrig would be in the 500 home run and 3,000 hit clubs. Okay, so let's recap the 12 card lot. The 3 above and these 9 cards for $40 shipped. How'd I do?